FIGHTING SUN (AUS) (Bay 2011-Stud 2014). 2 wins at 2, A$143,750, ATC Canonbury S., L, Membership on Sale 2YO P. Out of SW Irish Darling (SAJC Australasian Oaks, Gr.1). Grandson of a half-sister to the dam of SW Dragon Maiden (Taranaki 2YO Classic, Gr.3). Same family as SW Battle Eve, SW King Delamere, etc. Sire of Platinum Mam'selle and of the placegetters Darmasun, Fighting Harada, etc. His oldest progeny are 2YOs. SPARKLING MISS, by Artie Schiller. 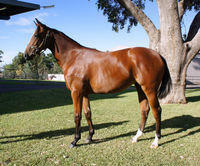 Winner at 1200m, BRC Grinders Coffee P. Half-sister to We've Got This. This is her first foal. We've Got This (Hard Spun). 4 wins at 1200m, A$277,860, MRC Cove Hotel H., VRC Hong Kong Jockey Club H., 2d VRC Gilgai S., Gr.2, Union Road Community Hub Trophy, Hugo Throssell VC H., MRC The Cove Hotel H., Pakenham RC O'Connor Vobis Gold Bullion, 3d SAJC William Hill S., Gr.2, VRC Bobbie Lewis H., Gr.2. Sparkling Miss. Winner. See above. To the Letter. Placed in 2017-18 in Aust. Nedrullah. 6 wins to 1550m, A$107,975, MVRC Gogong H., SAJC Distinctive Lifestyle H., Mistral H., 2d SAJC Scott Group of Companies H., Tokyo City Cup H., Skycity H., 3d MRC Woorak H.
Akiva. 5 wins. See above. What the Heck. 7 wins to 1400m to 2016-17 in Aust. Adderley. Winner at 2150m in Aust. SLICK BROTHER (Amen Brother). 9 wins-1 at 2-from 1000m to 1600m, A$129,110, SAJC Ansett Australia Sprint H., L, Tattersall's Cup, L, Malaysia Airlines S., L, Floodbird H., Welter H., H&H Industry H., Bonnett's Saddlery H., Peter Elberg Funerals P.H., 2d SAJC Adelaide Guineas, Gr.3, HC Nitschke S., L, 2YO H., La Bamba H., Womens Suffrage Welter H., 3d SAJC Tattersall's Cup, L, Clipsal Sprint H., Peter Elberg Funerals S.H., Hunting Horn H., Kingston Town H.
Sparkling Salute. 9 wins. See above. Son of Carringbush (Carringbush). 2 wins at 2000m, 2200m, VRC Dayana H., 2d VRC Skipton H., Royal Australian Navy H., 3d VRC St Leger, Gr.2, SAJC St Leger, Gr.3, VRC Kentucky Chicken P.
Toka Boy. 14 wins from 1000m to 2050m, AJC Encourage H.
Lo-Tar. 7 wins-1 at 2-from 1000m to 2100m, VRC Drongo H.
Tiara Bangle. 6 wins at 1600m, 1700m, MVRC Glen Orla H., WR Kemball H., 3d MVRC Glen Orla H. Producer. Our Dana. 5 wins from 1350m to 1600m, BATC Novice H.
Sir Filou. 5 wins from 1500m to 2000m, QTC Intermediate H.-twice. Persian Otto. 8 wins from 1200m to 2400m in Aust. Be My Gem. 5 wins from 1400m to 1600m in Aust. Gemmick. 2 wins at 1400m, 1600m in Aust. Producer. Mild Temptation. 3 wins from 1500m to 1900m in Aust. Mandator (Mandana). 8 wins from 1600m to 2650m, A$84,040, MVRC Magdala H.-twice, Mount Alexander H., VRC Birthday H., 2d VRC Headquarters H., L.
King Marquis. 2 wins at 1500m, 1700m in Aust. Slick Jewel. Winner. See above. Ralahamy. 8 wins from 1400m to 2000m, A$79,275 in Aust. Sound Judgement. 4 wins-1 at 2-to 1400m, SAJC SGIC Superannuation H., 2d SAJC Rajah Sahib H., BP Keeps You Moving H., 3d SAJC Sheraco H., Denhoti H., Eve Balance H.
Duellen. Winner at 1800m, 2d SAJC Umrum H., 3d SAJC Umrum H., Harris & Orchard H.